Nylon Locking Vent Plugs are available in 3/4", 7/8", & 1.0" diameters. Designed with multiple locks to positively snap in panel thicknesses ranging from 1/64 to 1/8". 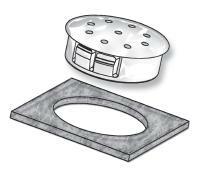 Locking Hole Plugs are used to close excess chassis holes, wiring outlets, and production access holes. Double locking finger design allows for snug fit on variable thickness of materials. SUITABLE FOR CRITICAL OR ELEVATED TEMPERATURE APPLICATIONS. *OUR OVER-STOCKED PARTS ARE FLAGGED ON THE RIGHT OF THE TABLE. IF YOU WISH TO BUY ANY, YES - ANY QUANTITY OF THESE PARTS, PLEASE GO TO THE OVERSTOCKED COLUMN AND CLICK ON THE COLOR THAT YOU WANT IN THAT SIZE. YOU WILL GET A SPECIAL SALES PAGE THAT ALLOWS YOU TO PICK ANY QUANTITY YOU WANT - NO DAILY MINIMUMS - UNTIL DEC. 1. TO ORDER: Click on Part Number to order on the Shopping Cart; OR, get better pricing by requesting a QUOTE.